In a world where Caterpillar is considered a global industrial bellwether and a key indicator of economic inflection points, then today's downgrade of Caterpillar by Deutsche Bank is a harbinger that the recent risk on euphoria may be coming to an end. Shares of the industrial giant fell after Deutsche Bank downgraded CAT to Hold from Buy, slashing its price target on CAT from $152 to $128: Explaining his rationale, DB's Chad Dillard said that "we are adjusting our 2019 EPS from $12.41 to $11.80 (vs. guide of $11.75-$12.75 and street of $12.22) and our 2020 EPS from $13.48 to $10.40 (vs. street of $13.06) to reflect our lowered expectations for global growth. 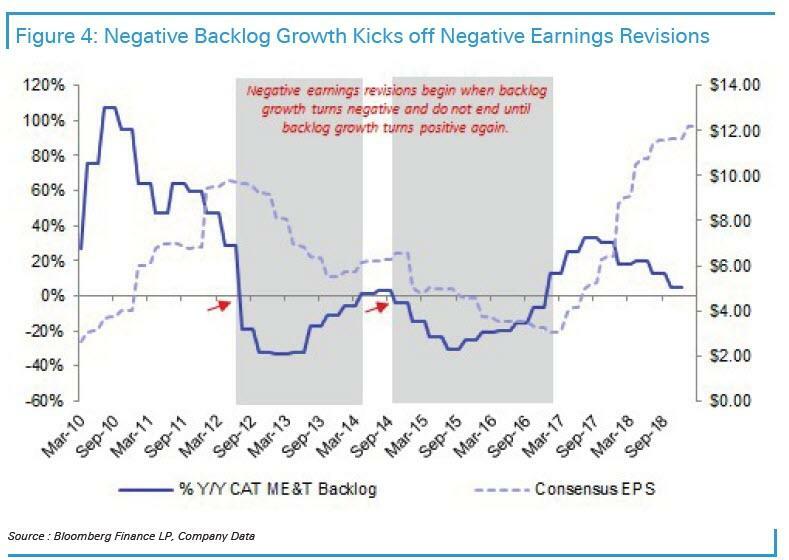 We value CAT on 6.5x our 2019 EBITDA for ME&T (vs. 7.5x previously, with the shift reflecting our updated view that we are at peak) and assign a 1.5x price to book value for the FinCo to arrive at our $128 price target." Our proprietary Global Growth Model is a 6-9-month leading indicator for CAT’s backlog growth, which is likely to turn negative in the next 3 months. 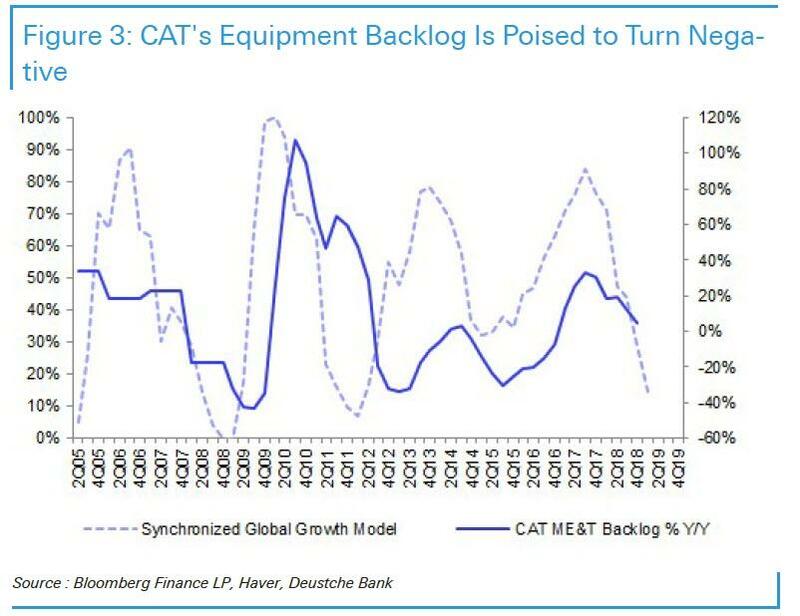 As of 4Q18, CAT’s backlog was up 4%, but slowing global growth is likely to lead to a decline of 10% in 1Q19 and turn more negative in 2H19. The key takeaway here is that CAT’s 2019 numbers are at risk regardless of what happens from sentiment perspective (trade deal, better China data, etc.) - it will still take another 6-9 months for this improved sentiment to convert into sales for CAT. In terms of actual macro drivers, Dilllard says that "synchronized global growth has collapsed, the China Land Cycle is rolling over (and will continue to weaken despite the single positive data point this week), Europe is slowing more than expected and the US is oversaturated with construction equipment. 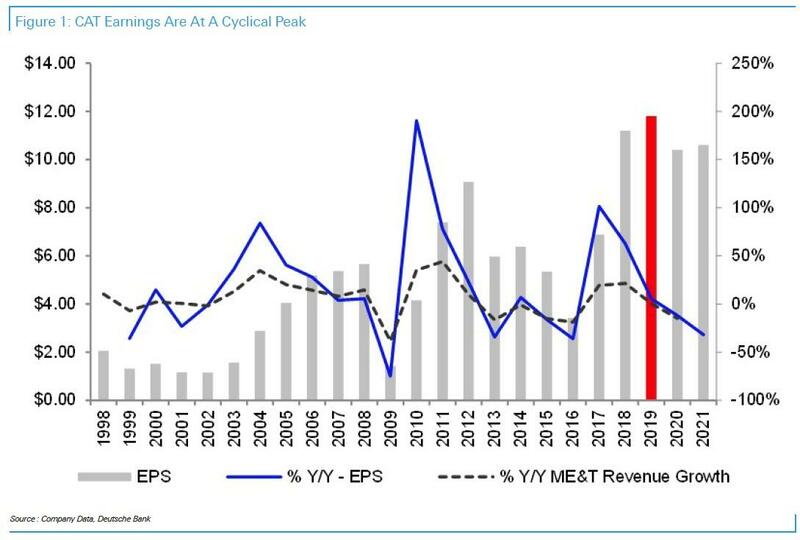 Each of these factors alone are powerful drivers of CAT’s earnings, but together this synchronized slowdown will not only usher in a negative earnings revision cycle, but also make 2019 the cyclical peak." As a result of the rising headlines, Dillard predicts that "Street numbers for 2019 and 2020 are 5% and 20% too high, but the current share price does not reflect this reality." 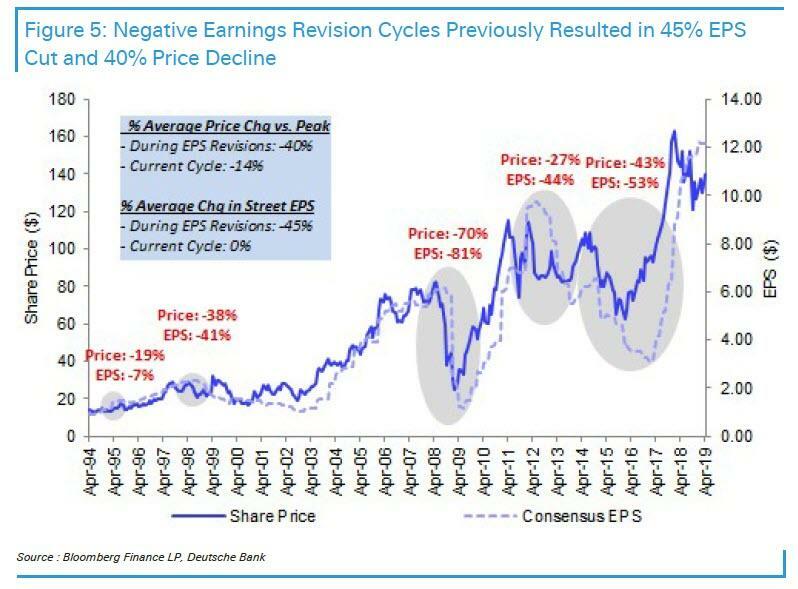 And while Deutsche Bank acknowledges management "has done a tremendous job improving cross-cycle earnings power and the balance sheet optionality is impressive, we fear these positives are already priced in and the oncoming down-cycle is too powerful to overcome." As such, we view the risk/reward as balanced and downgrade CAT from Buy to Hold and update our price target to $128. 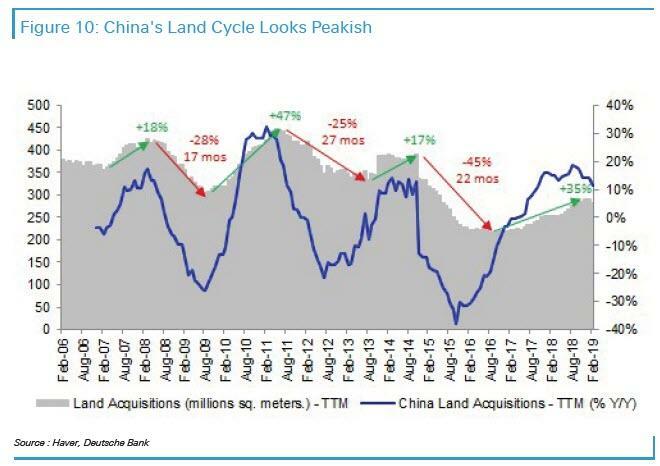 2) The China Land Cycle Is Rolling Over (45% of CAT’s (in)direct sales) – China land sales volumes are at a cyclical peak (up 35% from trough vs. +25% historically), the rate of change (a consistent directional predictor) has gone negative and a down-cycle in land results in a 30% decline and takes 24 months to trough. Land Sales are a 2-9 month forward predictor of CAT equipment demand, so the recent slowdown has not fully reached CAT’s sales. The slowing land cycle in China poses an outsized risk to CAT. Judging by historical measures, the China land cycle is at the peak. Land sales volumes are up 35% from the prior trough (vs. a historical 25% increase) and Y/Y growth recently turned negative (down mid-single digits in the last month). Land sales volumes typically trough 30% below the peak and take 2 years to get there. If we use this framework, it would suggest there is further to go in this down cycle, which poses an outsized risk to CAT. The street expects CAT’s Europe business (25% of sales) to grow by 5% in 2019, but we see downside risk and expect sales to decline by mid to high single digits, presenting 20c of downside risk to street numbers. 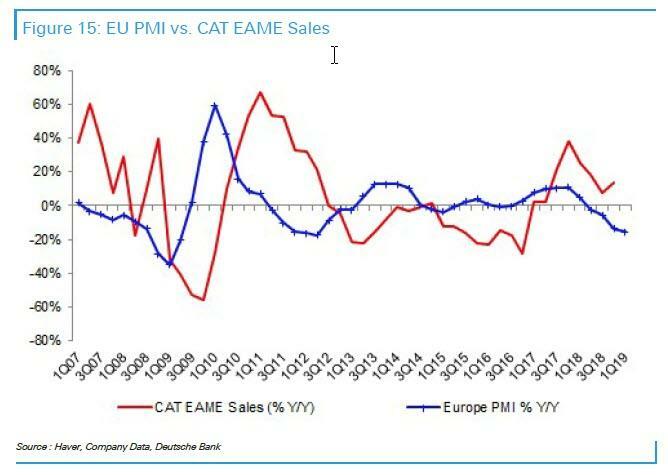 The Europe PMI is a 4-quarter lead indicator for sales growth and it turned negative last year, which would suggest sales turns negative starting in 2Q19 (down form mid single digit growth in 1Q19). For 2020, sales could be down closer to 10% vs. street expectation of 10%, which implies 60c of downside risk to consensus EPS. 4) The US is Oversaturated With Construction Equipment (20% of sales) – equipment spending as a % of GDP is at a 40-year high and historically sales. The US is rapidly becoming oversaturated with construction equipment, which represents 20% of CAT’s sales. 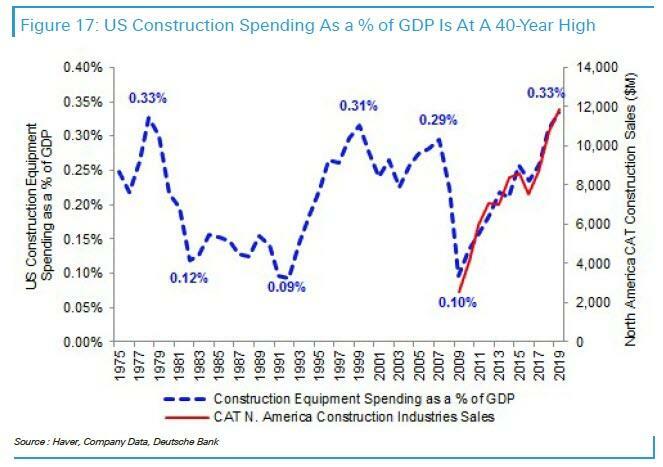 CAT’s US construction business is likely to be down 10-15% in 2020 (vs. street of down 3%). US equipment spending as a % of GDP has hit a 30 year high of 33bps. Historically, after hitting these peak levels, sales have declined by 17% in year 1 of the downturn and by 25% in year 2. Also, we are starting to pick up a few negative data points already this year: customer delays of rental equipment delivery, CNHI under-producing demand in 2019, DE posting a retail sales decline last month), negative readings in the ABI/Dodge Momentum index. If CAT’s equipment sales are down 10-25% next year, then it could pose 35c-95c of downside risk to 2020 earnings. DB's macro bottom line was that within its coverage universe, "CAT is one of the stocks most sensitive to weakening international growth. CAT has a 0.77 correlation with our proprietary Global Growth Model. Also, it has the highest exposure to international sales (ex. ag equipment), which represents 55% of CAT’s sales." 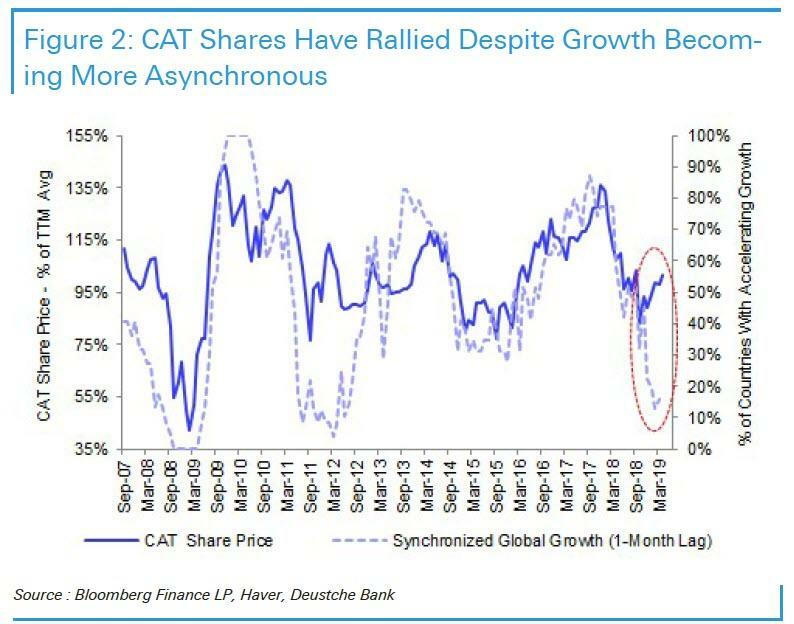 And since global growth is crumbling, it is only a matter of time before CAT stock follows. While DB's points are all accurate, the market appears to be discounting almost everything he said and the stock is barely lower in premarket trading, down only 50 cents, and still trading at the highest level it has since last October.